Qatar has teamed up with Turkish contractors to build the new $2.1 billion Al Khor Expressway ahead of Qatar 2022 FIFA World Cup. The Ministry of Municipality and Environment signed an agreement with the Turkish Tekfen Holding Construction company to construct a new superhighway. 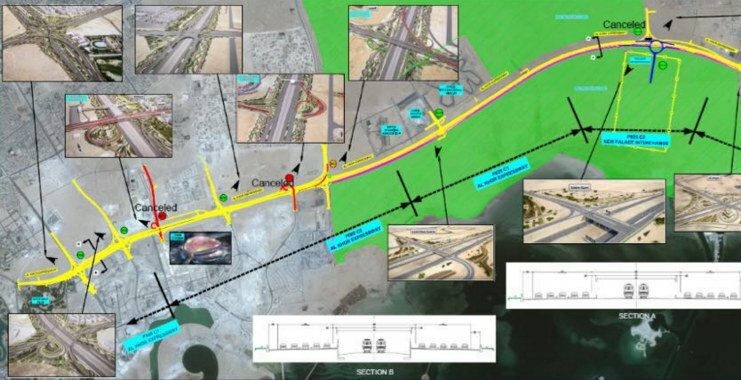 The deal is the first step towards bringing the massive Al Khor Expressway to life. For $2.1 billion (QAR 7.6 billion) Qatar will get huge highway with five lanes in either direction, complete with overpasses and underpasses. The 34 kilometer long superhighway will also come with eight intersections, as well as pedestrian, bicycle and specialized motorcycle lanes. Al Khor Expressway is currently the world’s largest infrastructure project, and will connect Doha with the cities of Lusail and Al Khor, as well as the new stadiums which will host games during the Qatar 2022 FIFA World Cup. Business between Qatar and Turkey has increased during recent years, with Turkish contractors currently committed to 119 projects in Qatar, worth $15 billion. In fact, the same company, Tekfen is also upgrading the Al Shamal Road in a $1 billion project, expected to be complete by the end of 2016. With the trade between Turkey and Qatar rising to $1.3 billion in the last five years, Turkey aims to sign a free trade agreement with the Gulf Cooperation Council and grow closer economic relations with Arab Gulf states. Al Khor Expressway is scheduled to be completed in 36 months from ground break.